When I saw the Juice carton ice sculpture idea over at The Artful Parent , I knew CJ would love it. Balloon ice sculpture - Mom to 2 posh lil divas and Colorful ice sculptures - Chocolate muffin tree increased our interest double forth and here are some of our ice sculptures. We created different ice sculptures using Juice carton, Plastic Easter eggs, Building Blocks, Beach toys, Real egg shell, Egg carton, Popsicle Ice molds. We used different types of Easter eggs, the normal ones and the animal shapes too.To freeze the water in them, first we placed the egg molds in egg cartons as shown below. This method made it easier to pour water at a stretch and store the molds in freezer. Start playing by sprinkling some salt on the frozen eggs, this will cause some holes and different textures on the surface of eggs. Add some drops of food color and have fun experimenting! To take out the ice, we showed the outer surface in water and opened it after 2 mins. We got a beautiful turtle shape, how fun! To take out the ice. keep the building block in running water, leave for a min or 2. Tap the ice out with a knife and pull. CJ loved playing with the ice building blocks! This was an accidental find and an unexpected result. When we used egg cartons to store the Easter eggs, some water had slipped to the egg cartons. After freezing, we got a egg carton layer surrounding the egg which let to egg carton ice cups. How exciting and fun! We poured water in an empty egg shell and placed it in an egg carton for freezing. We were too excited to try the experiment that we took out the egg before it was completely frozen. Peeled it just like a boiled egg. Because it was not completely frozen we got a hole in the middle. CJ also played Ice architect by sculpting with her tools! Really neat! Those turned out really well. I like how you experimented with all kinds of shapes and ideas. What brilliant frozen fun! Reminds me of kryptonite and superman! Great (cold) spin on building with blocks! Thanks for linking to Link Your Mess! 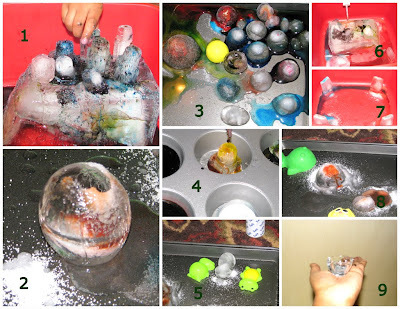 What an awesome way to learn about the properties of ice and water! I love how you added the food coloring, too! Thanks for linking up!! Look at all of those fun ice molds- great work! Thank you for sharing this on The Sunday Showcase! THis is excellent! I love the idea of the plastic Easter Eggs. Thanks for sharing! This is a fabulous post! Sorry I missed it last year!